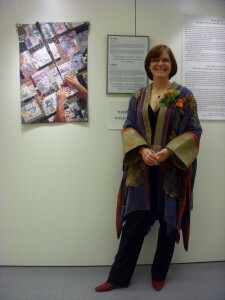 Comments by Quilt Artist Lea McComas prepared for the opening of the exhibit, Peace Quilts: Women’s Power and Resilience in Conflict, in Geneva, Switzerland on March 8, 2011 (The 100th Anniversary of International Women’s Day). I come here from just outside Boulder, Colorado. All in all, life is good there. I have a loving husband. I live in a comfortable home in a safe neighbor hood. I have a secure job teaching at a day treatment facility for troubled teens. The work is challenging, but I share it with a team of good people and I feel that I’m making a difference. An important aspect of my job is that I’m expected NOT to bring it home. This leaves me time for my real passion: art. I rise every morning at 5 AM and go to my studio to work for 2 hours. I get to start my day creating. No matter what happens in the hours that follow, I have already spent 2 making art. These are all elements of a great life. My needs are simple and I have what I need. I have been able to eliminate the harsh and dangerous from my world. I have only enough sharp edges and rough spots to keep life interesting. As an artist, my work generally reflects the beauty that I find in my world. I create art that makes you want to stop, look, get to know. I create art that evokes fond memories and helps one feel connected and curious. On New Year’s day, when I became aware of this quilt challenge, it spoke to me. I can’t say why. This issue of violence against women, to that moment, had not taken up a great deal of space in my consciousness, but it did move in and began to set up residence that day. After just a bit of research and thought, an idea began to take hold in my mind. I had just finished my last art piece ahead of schedule. I had the time and the idea, why not go for it? My quilt began as a collage of images of women involved in the work of caring for family: providing food, shelter, clothing, comfort. I drew from photos collected over a decade of living, working, and traveling overseas. Once assembled, the quilt top was torn, cut, burned and shot; literally, tearing families apart. Then, a woman’s hands were added over the top. They are shown working to stop the destruction, mend the damage, and repair the vision. I assembled and completed the piece in just 2 weeks. But, finishing the piece and sending it off was just the beginning. This issue of violence against women has maintained residency in my mind. Now, not a day goes by that I am not aware of it: news reports on the TV or radio, the BBC app on my phone; Sometimes it’s a comment made by a student or a therapist with whom I work. It won’t leave me alone. And I realize that it is tolerated: not in my life, but in my life time. Awareness has come to me in a fuller measure. I read accounts of acts against women that shocked and sickened me. With the evidence before me, I sometimes had to walk away from it. How fortunate for me that I had that option. It is as if I have been given sight, when I didn’t even know I was blind. As a result, my art has taken a dramatic turn. The piece I’m working on now called “cocoon” is an attempt to do something with the realization that I am connected to these women who live daily with the threat of violence and the shame of having been violated. These are my sisters, my mothers, my daughters. My actions on their behalf are not only important, but imperative. Now, I stand amazed at my own artistic process, that only after completing the work and sending it away, have I come to truly understand it. It speaks to me now as if I am a stranger meeting it for the first time. Then, in the company of these other quilts, each raising their voice, it’s like a choir. Some sing the part of hope. Some sing the part of tragedy. Some sing a call to action. Others lament the loss. There is a kind of harmony in this exhibit. I hope you can you hear it? I pray you can you join it?